Burlybed Original is made from 100% Miscanthus. We take the product in its natural cane form and process it right here on the farm. Our bespoke production process shreds and breaks up the hard outer casing of the cane to expose the soft and pithy inner core. It is this core that gives Original is ultra-absorbency and the hard outer casing that make such durable bedding. We then double dust extract the raw material to ensure it is as clean as possible before baling, stacking, wrapping and sending it on its way to our stockists. We add nothing to our Burlybed Original except our time and expertise. Every bale is 100% Miscanthus, processed on the farm so that the very best, totally natural product makes its way to your horses or ponies stable. HOW DO I USE BURLYBED ORIGINAL? 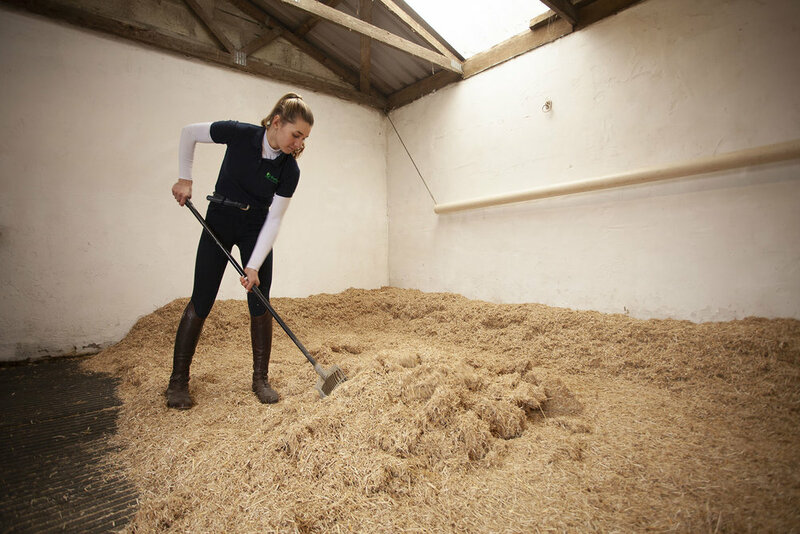 You can use our bedding however suits your horse and your own stable management but for the very best results, we suggest a deep litter system. Our bespoke production process uniquely exposes the ultra-absorbent inner core of Miscanthus. By using a deep litter system the moisture and odours are absorbed within the bed, leaving the top dry. Droppings on the surface can be easily removed. The chop size is designed to easily fall through your fork reducing wastage. In an average 12’x12’ stable we recommend using 5 to 8 bales to set up a deep bed. Top up when necessary, often as little as half a bale per week. IT SEEMS LIKE SUCH A LOT TO PUT DOWN TO START WITH? The depth of the bed is not to mask moisture and droppings, it simply gives the Original the chance to work its absorbent magic deep within the bed, leaving the top clean and dry. DO I REALLY HAVE TO PUT DOWN THAT MUCH? No, you don’t! Burlybed Original will still work its magic for you if you use less. Using a smaller bed on rubber mats will still be absorbent. However, by starting with a fresh deep bed you will top up by less saving money in the long run. As a 100% natural product, it rots down quicker than shavings and straw and can be spread straight on the land. I LIKE THE SCENTED BEDDING TO MASK ODOURS, WHY ISN’T BURLYBED ORIGINAL SCENTED? We are very proud to say that our Miscanthus is grown without chemicals or artificial fertilisers and processed without any additives at all. Its highly absorbent core seals in any odours. By keeping it natural it rots down quickly and spread it straight on the land with no negative effects. We take the time to double dust extract Burlybed in its processing. We would never claim to be 100% dust free. What we can say is that it has an incredibly low dust content. We get asked this question the most! Miscanthus has a unique, pithy inner core. This core is ultra-absorbent and not very palatable. Of course, there are inquisitive horses that will have a taste. Much like trying to eat a mouthful of cream crackers, it’s virtually impossible to swallow and comes straight back out again! WHERE CAN I BUY BURLYBED ORIGINAL?